CGM handles PR and social media for the Duncan Edwards Tribute, whose aim is to ensure that the Manchester United and England footballer is always remembered and treasured in his home town of Dudley and the wider Black Country region. 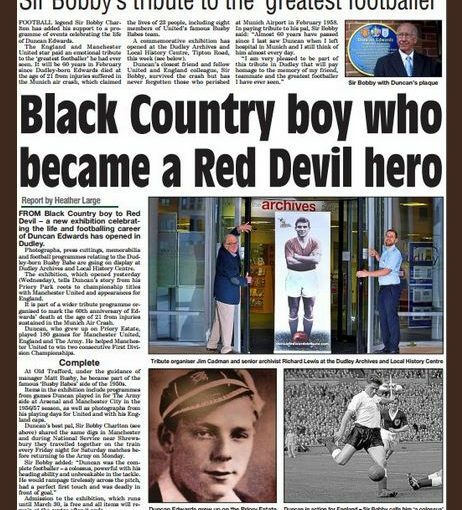 Included in the tribute programme are an exhibition at Dudley Archives and Local History Centre, a gala dinner at the Copthorne Hotel in Dudley, an educational heritage package created in conjunction with staff and pupils at Duncan’s old school Priory Primary, a wall of remembrance at St Francis Church in Dudley and a book entitled Duncan Edwards – Black Country Boy to Red Devil. 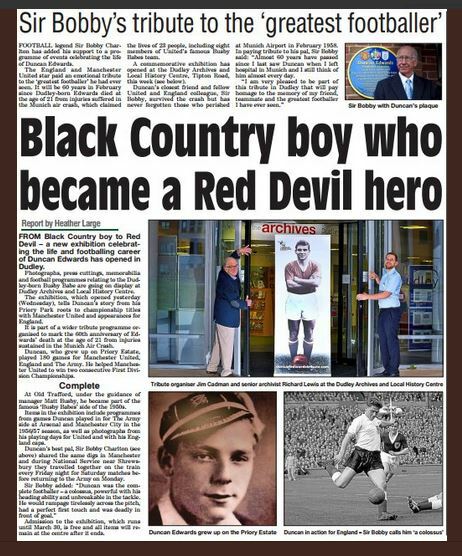 The Duncan Edwards Tribute has had extensive media coverage courtesy of ITV Central News, BBC Radio WM, Black Country Radio, Express and Star, Dudley Chronicle, Dudley News, Stourbridge News and the Manchester United FC matchday programme.